Social networks are the in thing today. 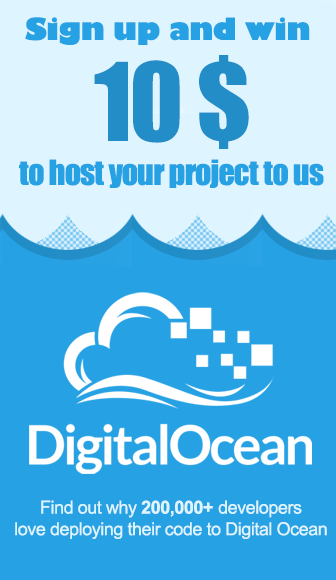 There are newer ones being developed everyday that are taking the industry by storm. 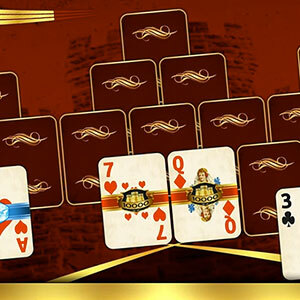 Our profiles on each of them are tailored to all the people we connect with on that platform. What most of these social networks fail to see is that our relationships with each person differ and hence the contact information and profile shared with each person should also be unique. This is exactly where the iOS app Pushdot comes into the picture. It understands your relationship with people and shares only relevant contact details with each person. Essentially, Pushdot is like your online business card- one that has the exact details you would like to share with a person you meet. The only difference is that this one is in an app form instead. With the advent of social media, it is quite easy to stalk a person online and know all his personal details and life history. People post all kinds of content that defines them online through the day. This helps people online understand us better and form an opinion of us. With the use of Pushdot, you can take all of these social media profiles, email addresses, web addresses and more and share them on a personal level with people you network with. 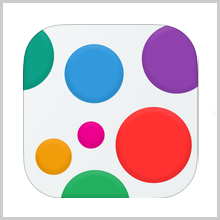 Pushdot is currently compatible with the iPod Touch, iPad and iPhone, requiring iOS 8.0 or higher versions. 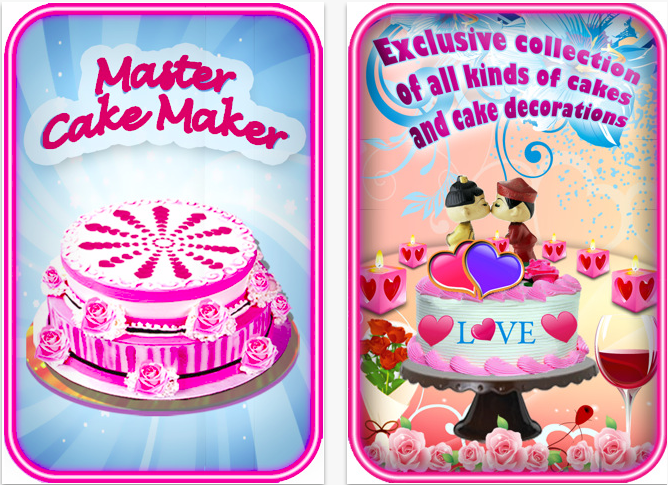 It is available for free download in the App Store. 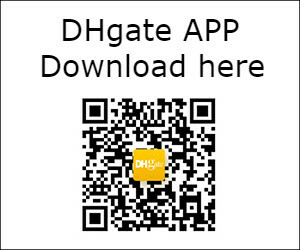 Once you have downloaded and launched the app, you will be asked to create an account with the app on the first time. 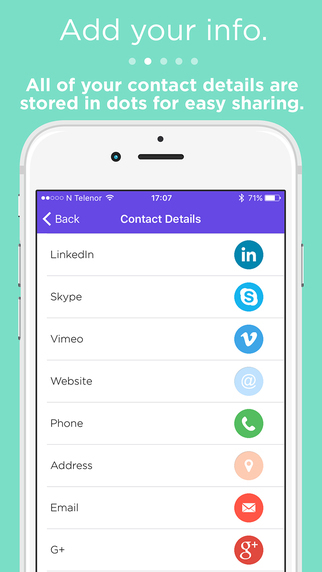 This enables you to share contact details with the tap of a single button. This account will act as a connecting media for all your social media profile links, addresses, phone number, email addresses and more. 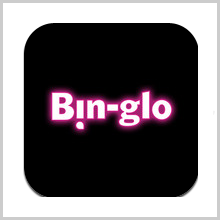 The good part about the app is that it does not enforce that people who you are networking with must have the app too. 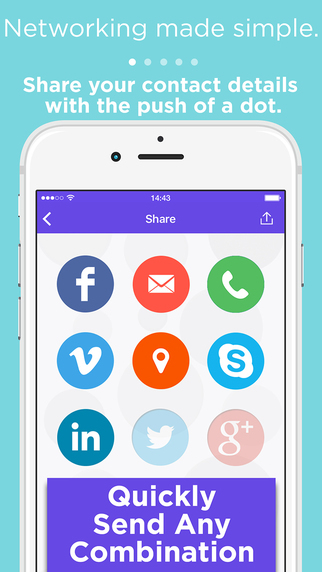 If the person you are sharing your details with has the app installed, the details are shared via the app. If the person you are sharing your details with does not have the app, Pushdot will then create a text message or e-mail to send to that individual. 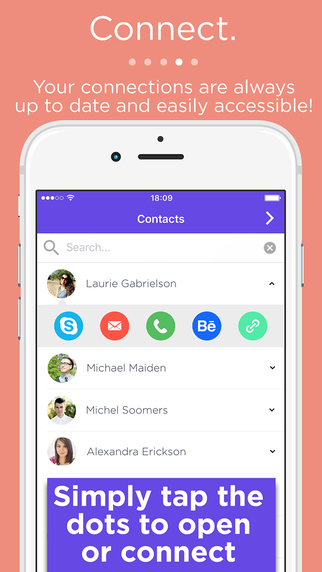 When you wish to share your contact details with a person, you simply have to tap on the Share button at the top right corner of the home screen of the app. This will then take you to the Share screen where you will see buttons for each of the links you’ve added to your contact details. There are also fields to enter your email and personal phone number and allow networking via Facebook. To select the contact details you wish to share, you merely have to tap on the button of the links you’d like to share. Once you have selected all the details you’d like to share, you then have to enter the contact details of the person you’d like to share the details with. 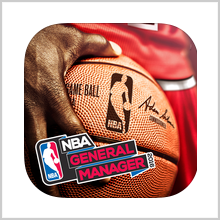 NBA General Manager 2016 New Season: Action Packed !